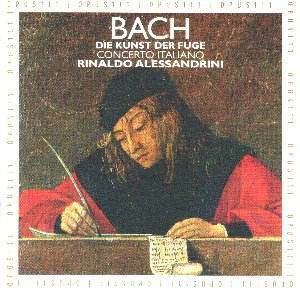 Johann Sebastian BACH (1685 -1750) 74'27"
Bach's "Die Kunst der Fuge", better known in English as "the Art of Fugue" is one of western music's great imponderables. The story briefly is this. Bach was a member, along with mathematicians and composers who included Handel and Telemann, of a Society "For the furtherance of Musical Science". One condition of membership was that members had to present a paper or a composition with a scientific content each year. The great man died in 1750, and left unfinished a work that was likely to have been his submission to the Society for 1749. His son, C.P.E.Bach, after his father's death made clear that the penultimate section ( a fugue on B,A,C,H, ) had not been finished, but publication would go ahead and it would incorporate a closing chorale completed by family and friends. As published the work has 24 sections (including the incorporated chorale). Ever since publication the work has been a musicologist's delight and is still 250 years later as enigmatic as it ever was. The puzzle is two-fold. Firstly, was the work meant to be performed, or was it simply to be a mental visualisation of the written score and its complex counterpoint? Or, if it were to be played - on what combination of instruments? No clues were given by Bach and generations of musicians have made their own decisions as to performance and instrumentation in a variety of ways - orchestral, chamber groups, solo keyboard and so on. The choice made on this CD by Rinaldo Alessandrini was to use varying combinations from nine players (giving a choice of twelve instruments) from his Concerto Italiano - a specialist period music ensemble which uses a combination of original instruments and modern copies of originals. The combination of strings, woodwind and harpsichord gave an extra tonal variety that is sometimes lacking in dry as dust versions of this work. In Contrapunctus 4 for instance, the blend of flute, oboe d'amore with its distinctive timbre, bassoon and cello was captivating, swinging even - followed quickly by the beautifully articulated 1st canon for solo harpsichord. The excellent recording allowed the ear to revel in the musical cats-cradle of Section 9 - all the players were used in this one - and every line could be clearly heard. Section 16, just two players - violin and harpsichord - again showed imaginative selection. Intriguingly the closing section was played by a conventional string quartet. All through, in this esoteric work built on the simplest of structures, the rhythms are buoyant and with the combination of fine playing, a splendidly judged instrumental mix and an excellent recording this release must be highly recommended.